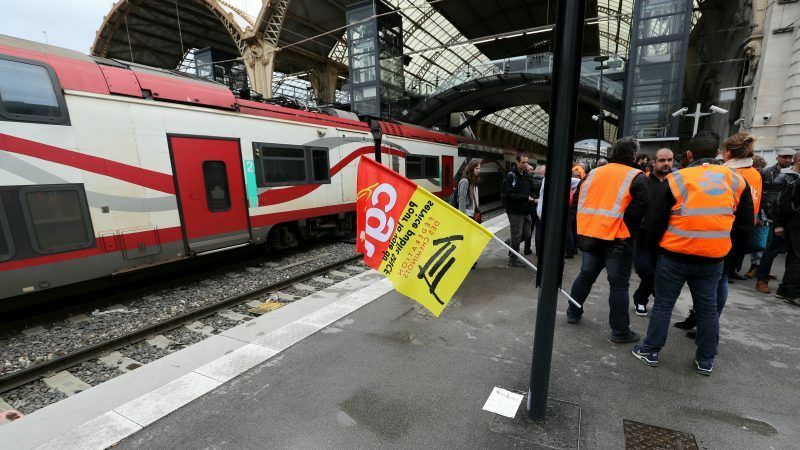 Travellers grappled with another crippling wave of transport strikes in France on Sunday (8 April), as train workers protested President Emmanuel Macron’s economic reforms and a stand-off between the government and rail unions hardened. La SNCF vaut largement la Deutsche Bahn. Donc je reste convaincu qu’avec l’ouverture à la concurrence, la qualité et l’offre vont largement s’améliorer. The SNCF forecast that 43% of workers needed to make the train network run smoothly would walk out on Monday as stoppages continue, affecting local trains as well as regional lines and some international journeys. That marked a slight a dip in participation compared with 48% in the last 48 hours of walkouts on Tuesday and Wednesday last week. Locking horns with the rail sector has backfired on previous French governments – paralysing train strikes in 1995 forced then-Prime Minister Alain Juppe to pull planned reforms. The SNCF reform has drawn public support so far, and 56% of French people thought the train stoppages were unjustified, according to an Ifop poll published on Sunday in the Journal du Dimanche. But discontent is also brewing in other sectors. En dépit du mouvement de #grève en cours, 62% des Français espèrent que la réforme de la #SNCF engagée par le gouvernement sera menée à bien.